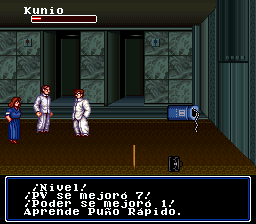 Some people call this game River City Ransom 2. It’s by the same people, and it’s the same type of game. So I can see why. 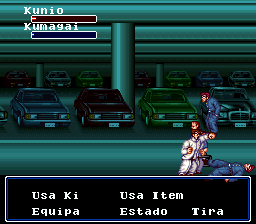 The only problem is that what I’ve played of it is helluva less fun than the original River City Ransom. The premise is the same as every other brawling game out there. You walk around the streets, subways, buildings and what have you and beat up everyone that isn’t you. Simple, yet effective. 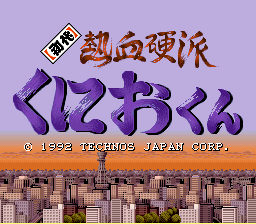 The graphics in this are obviously better than the original RCR, being for the SNES and all… but they took out the shopping part of the game. [s]Stealing[/s] Collecting money and buying stuff was one of the cool things with RCR… It’s just not the same without shops. However, the game is still packed with all the corny dialog you can shake a stick at. If that’s your thing, this game is sure to amuse you for at least a few hours. 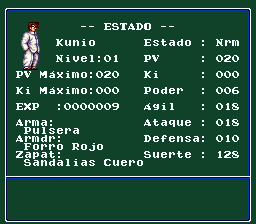 Translation to Spanish for “Shodai Nekketsu Kouha Kunio-kun” for the Super Nintendo. 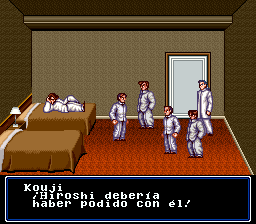 Based on the translation by Aeon Genesis.